Yuuga means something like 'elegance' from what I know, I merely used it to sum up Nouhime herself in my opinion as the original title/text on the wallpaper doesn't fit and is just too long. The text is from something that's said on Wikipedia of what Oda Nobunaga called her. I just had to put text in it but couldn't think of something fitting and with a little bit research I ended up with this. I had this vector dusting around for quite a while (couple months) An idea pop in my head as usual when I was thinking what I had left to finish, looked through my dusted vectors to find this vector of mine. I intended to make it on a black background but it didn't quite fit so now it's a sort of soft pink. Used vector lines, warp and selection + brushing to create most of the effects in here. There's nothing special about it except that it's an abstract wallpaper (it's rare coming from me) and my first upload for this month. Although it's not themed for this but just because it's so colourful. Happy New Year everyone! Special thanks to Gin and Christabel for being my judges on this (I screwed up the size a little bit xD). I love it! The colors are really elegant and soft! 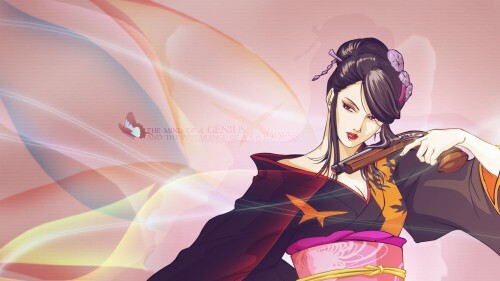 I haven't heard of this one, but the concept is cool - a girl wearing a kimono and brandishing an old-school pistol. Really good. I love the colors and what you did with the bg, is simple but I like it. This is a very nice wallpaper. The background is very harmonious with Nou-hime and I like how anachronistic her weapon choice is. I adore this femmele fatale wall, espectacular! Tiene un aire de belleza y peligrosidad, como hacen esos rostros tan hechisantes! nouhime is awesome, thanks for the pic. BLACK CAT TOTALLY ROCKS MAN! ITS FREAKING AWESOME< TOTALLY!